LA Hotel Workers Win $15.37 Minimum Wage: a New Day for Labor in the United States? The Los Angeles City Council’s vote to raise the minimum wage for hotel workers is another herald of big changes coming in the way the United States deals with low wages and inequality. The Council voted 12 to 3 to raise the minimum wage for workers at large hotels to $15.37 an hour by 2017, which is more than the national median wage for women ($15.10 in 2013). Mayor Eric Garcetti will sign the bill after it receives a confirming second vote next week. The LA County AFL-CIO, UNITE HERE Local 11 (the LA area union of hospitality workers), and the Los Angeles Alliance for a New Economy, which led the campaign, don’t intend to rest on their laurels and will push for an across-the-board minimum wage increase to $13.25 an hour, far above the national minimum wage of $7.25 an hour. Mayor Garcetti strongly supports that bill, too. Remember that episode of The West Wing when Josh Lyman announced a secret plan to fight inflation? That was great. Turns out that Dallas Federal Reserve Bank President Richard Fisher has a secret paper telling us how to fight inflation: stop progress in reducing unemployment so that nominal wages never grow fast enough to actually boost living standards (or, never grow fast enough to boost real wages). In the interview, Fisher mostly characterized this as a Phillips curve that is flat at unemployment rates higher than 6.1 percent, but which starts to have a negative slope below this rate, meaning that future declines in unemployment should be associated with higher rates of wage-growth. However, if you’re really thinking in terms of a stable Phillips Curve, this means that we can simply choose what unemployment/wage-inflation combination we’d like without worrying about accelerating inflation. Currently, nominal wage-growth is running around 2-2.5 percent. 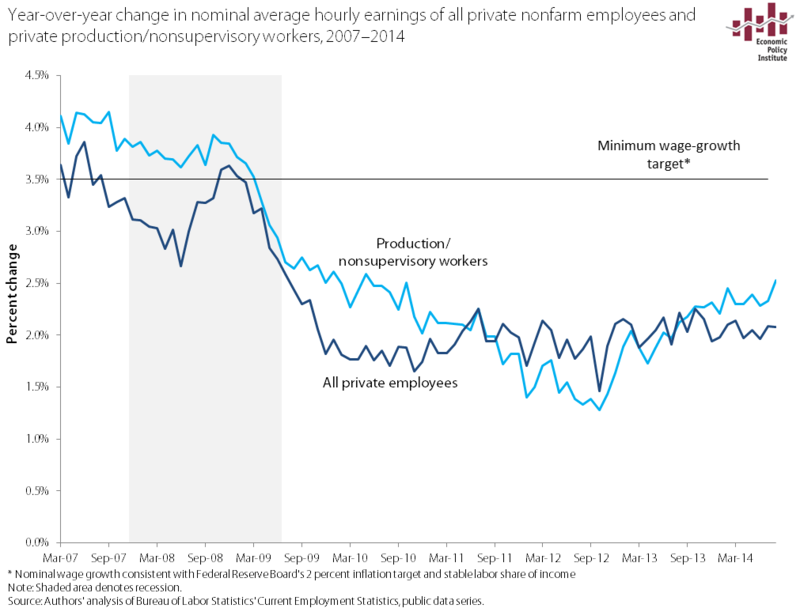 But as we’ve shown before, even the Fed’s too-conservative 2 percent inflation target is consistent with nominal wage growth of closer to 4 percent. So we have plenty of room to move “up” Fisher’s Phillips Curve before hitting even conservative inflation targets. Thursday’s release of 2013 American Community Survey (ACS) data allows us to fill in the blanks for minority populations that were not covered in Tuesday’s Census Bureau report on income, poverty, and health insurance coverage in 2013. ACS is an annual nationwide survey that provides detailed demographic, social, and economic data for smaller populations like Native Americans and the thirteen distinct ethnic groups that make up the Asian population. Together with the 2013 Income, Poverty, and Health Insurance Coverage report, the 2013 ACS data provide a more complete picture of the economic status of America’s various racial and ethnic groups. This information helps to address the sense of “invisibility” felt by many of these groups, provides critical information for the states and local communities where these populations are concentrated and expands the scope for evaluating the impact of national policies. Between 2012 and 2013, the real median household income for Native Americans increased 2.3 percent to $36,641. This was 70 percent of the national average in 2013 and $3,066 (-7.7 percent) lower than the group’s 2007 pre-recession level. The American Community Survey (ACS) poverty data that were released by the Census Bureau earlier today showed that poverty rates were essentially unchanged from 2012 to 2013 in virtually every state.1 Only six states had significant changes in their poverty rates: Colorado (-0.7 percentage points), New Hampshire (-1.3 percentage points), New Jersey (+0.6 percentage points), New Mexico (+1.1 percentage points), Texas (-0.4 percentage points), and Wyoming (-1.7 percentage points). All other states had no significant change from their 2012 poverty rates. The increases in poverty in New Jersey and New Mexico are the most troubling, although the lack of any significant decrease in most other states is also deeply frustrating. As shown in the figure below, North Dakota is the only state where the poverty rate has fallen back down to pre-recession levels. In every other state nationwide, poverty rates remain significantly above their 2007 levels. The failure to see any significant reduction in poverty over the last several years is a direct consequence of the continued weakness in the labor market. (It’s not surprising that poverty has fallen in North Dakota given that the state’s unemployment rate has averaged 3.3 percent from the start of the recession to today.) At the same time, however, policymakers have directly stymied poverty reduction by cutting back on unemployment insurance. If we want to start bringing poverty rates down, we need to restore the labor market back to full health, lift wages, and start sharing economic growth more broadly. 1. The ACS data also showed no significant change in the national poverty rate. This differs from the official national poverty rate generated from the Current Population Survey (CPS) that was released earlier this week, which did show a significant decrease in the share of families in poverty. This discrepancy is due to differences in the way the two surveys treat household members not related to the head of household, and the fact that the ACS data reflect a slightly different timeframe than the CPS. See here for further explanation. This morning the Census Bureau released its annual report on income and poverty within states, with data from the American Community Survey (ACS). This report follows the release earlier this week of national income and poverty statistics. Not surprisingly, the state report tells much the same story as the national data: for the typical U.S. family, incomes in most states were largely unchanged from where they were the year before—and still well below their levels from over a decade ago. 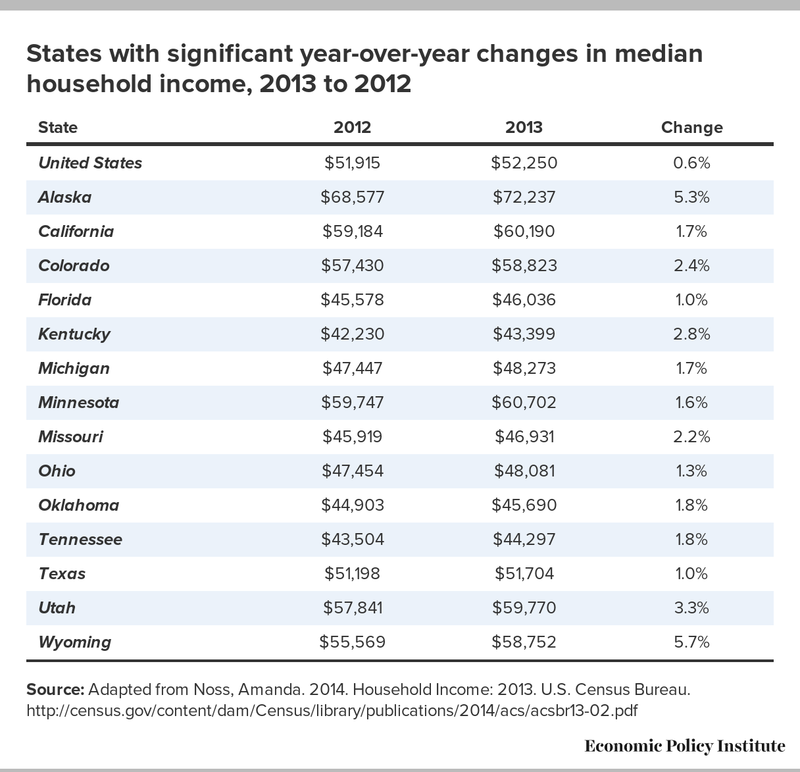 Between 2012 and 2013, median household income rose significantly in 14 states, while the remaining 36 states, plus the District of Columbia, had no significant change. The table below shows the states that had statistically significant year-over-year increases in median household income. The ACS data, which reflect a slightly different time period than the national income data gathered from the Current Population Survey, also showed a small, but significant increase in median income for the nation as a whole. While these modest improvements are welcome, the reality is that household incomes have yet to recover from the recession virtually anywhere. Only four states (Alaska, Wyoming, North Dakota, and South Dakota), plus the District of Columbia have regained their levels from 2007, and most states has not seen income growth in over a decade. The figure below shows median household incomes, by state, in 2000 and 2013. The overlapping bars show that in the vast majority of states, median incomes are still well below where at the start of the millennium. Only Maryland, Alaska, Wyoming, North Dakota, Iowa, South Dakota, Montana, Louisiana, West Virginia, and the District of Columbia have managed to regain or surpass their median income levels from 2000. As my colleagues Larry Mishel and Josh Bivens explain, “to get household incomes rising, we need to get real wages of the typical worker to rise, something we haven’t seen for more than a decade.” The policies that can help do this are not solely the province of federal lawmakers. A case in point: the only states that saw any wage growth over the past year where those that raised their state minimum wages. It’s been a busy week already for people who think about the economy. On Tuesday, the Census Bureau released its estimates of household income, poverty, and health insurance coverage for 2013. And on Wednesday, the Federal Reserve released its statement on monetary policy, projections of economic growth, and activity for the next year, and Federal Reserve Chair Janet Yellen held a press conference. Wednesday also marked the informal three-year anniversary of Occupy Wall Street (OWS). To incorrectly paraphrase Neil DeGrasse Tyson: it’s all connected, man. First, the Fed. The debate swirling around the Fed these days is how soon they should start raising short-term interest rates to slow economic growth and forestall excessively high wage and price inflation. The answer to this should be simple: not soon at all. Wage and price inflation remain extraordinarily low, with no evidence that they’re accelerating. In fact, wage growth could effectively double from its current pace before really becoming inconsistent with even the Fed’s too-conservative 2 percent overall price inflation target. So if this is what the evidence says, why is there a growing chorus arguing for the Fed to tighten? Here’s where Occupy Wall Street comes in. Tightening now would keep unemployment higher than it would be under genuinely full employment, and stopping job growth short of full employment is a powerful tool to shift bargaining power away from low- and middle-wage workers and keep them from realizing inflation-adjusted wage increases. This tolerance of sub-full employment is a big reason why inflation-adjusted wages for the vast majority have failed to rise at all for most of the time since 1979, and have certainly not risen anywhere near the pace of overall productivity growth. This wasn’t always the case, but starting in the late 1970s a number of policy decisions made on behalf of corporate managers and owners of capital helped tilt the playing field away from low- and middle-wage workers, and this has been a prime source of the rise in income inequality since. A key part of this inequality by design was having macroeconomic policymakers—particularly the Fed—slow the economy down before full employment could spur across-the-board wage growth. The one time the Fed did not slow the economy “in time”—the late 1990s—led to the first across-the-board wage growth in a generation. If OWS had a grand organizing theme, it was certainly along the lines of the idea that economic policy has helped generate the rising inequality we’ve seen over the past generation. They’re right, and macroeconomic policy that has privileged very low rates of inflation over very low rates of unemployment is part of how policy did it. As EPI’s Elise Gould pointed out back in January, a key barrier to translating overall economic growth in recent decades into rapid poverty reduction has been the rise in income inequality. Were economic growth more broadly shared, the poverty rate would be much lower. Here we make the case that this rise in inequality has large policy fingerprints all over it. Today’s data on income and poverty from the Census Bureau shows how a recent policy choice—specifically cutting back on unemployment insurance (UI) in recent years—has stalled poverty reduction. Unemployment insurance is a key plank of the American social insurance system. During the ferocious period of job loss and historically high unemployment during and immediately after the Great Recession, policymakers responded by significantly expanding the duration of benefits, and the American Recovery and Reinvestment Act (ARRA) included boosts to the generosity of benefits as well. The result was that in 2009, UI benefits kept 3.3 million people out of poverty. However, since 2010, this poverty-fighting impact has eroded, and the share of unemployed workers receiving UI benefits has fallen: Both of these trends are shown in the figure below. This is due to both the extended duration of unemployment for some workers outstripping the UI eligibility period as well as intentional policy changes that reduced UI recipiency. The federal government reduced total weeks available in 2012 and then all long-term benefits (those lasting longer than 27 weeks) were cut off at the end of 2013. (The impact of the long-term benefits cut won’t be seen until next year’s poverty figures are released.) Further, several states have also restricted eligibility. 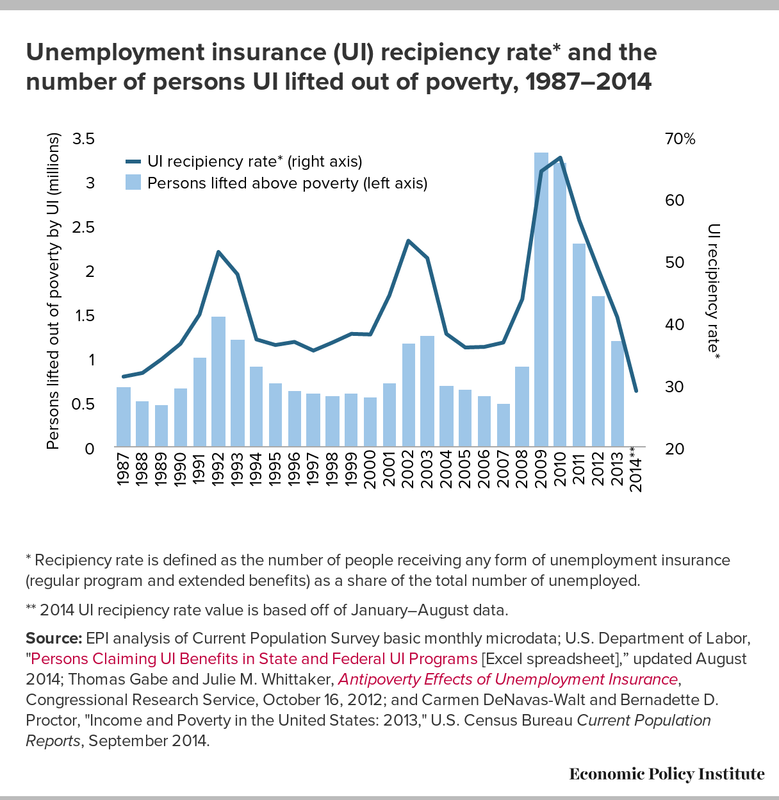 The result is that by 2013 only 1.2 million Americans were kept out of poverty by UI benefits. * Recipiency rate is defined as the number of people receiving any form of unemployment insurance (regular program and extended benefits) as a share of the total number of unemployed. ** 2014 UI recipiency rate value is based off of January–August data. Source: EPI analysis of Current Population Survey basic monthly microdata; U.S. Department of Labor, "Persons Claiming UI Benefits in State and Federal UI Programs [Excel spreadsheet],” updated August 2014; Thomas Gabe and Julie M. Whittaker, Antipoverty Effects of Unemployment Insurance, Congressional Research Service, October 16, 2012; and Carmen DeNavas-Walt and Bernadette D. Proctor, "Income and Poverty in the United States: 2013," U.S. Census Bureau Current Population Reports, September 2014. 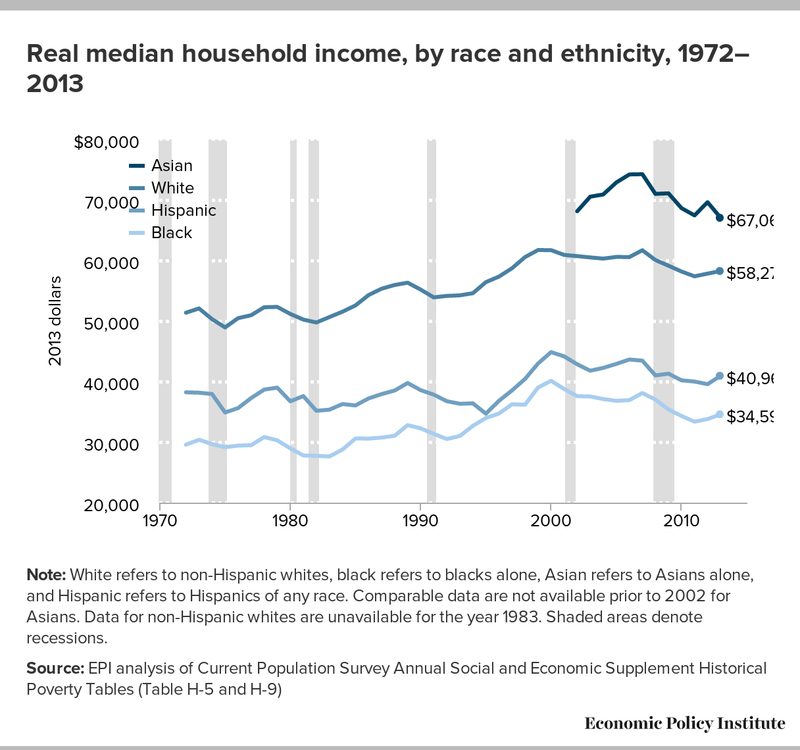 Today’s Census Bureau report on income, poverty and health insurance coverage in 2013 shows that real median household income increased more among Latino (+$1,391) and African American (+$793) households than white households (+$433), but declined for Asian households (-$2,568). Between 2012 and 2013, the black-white income gap has narrowed from 58.4 cents for every dollar of white median household income to 59.4 cents for every dollar of white median household income. The Hispanic-white income gap has also narrowed from 68.4 to 70.3 cents on the dollar. This is fairly consistent with the modest labor market gains made by African Americans and Latinos in 2013. According to the Bureau of Labor Statistics, between 2012 and 2013, the share of employed adults increased for each of these populations while the share for whites remained unchanged. Despite these relative improvements, real median household incomes for all groups remain well below their 2007 levels. Between 2007 and 2013, median household incomes declined by 9.2 percent (-$3,506) for African Americans, 5.7 percent (-$2,492) for Latinos, 5.6 percent (-$3,432) for whites and 9.7 percent (-$7,201) for Asians. Asian households continue to have the highest median income in spite of large income losses in the wake of the recession. Note: White refers to non-Hispanic whites, black refers to blacks alone, Asian refers to Asians alone, and Hispanic refers to Hispanics of any race. Comparable data are not available prior to 2002 for Asians. Data for non-Hispanic whites are unavailable for the year 1983. Shaded areas denote recessions. Key numbers from today’s new Census report, Income and Poverty in the United States: 2013. All dollar values are adjusted for inflation (2013 dollars). Today’s release of data on family income from the Census Bureau reinforces the fact that the generation-long trend towards ever-greater income inequality seems to be firmly underway again, after only the briefest interruption caused by the Great Recession. Several economic commentators noted the decline in income inequality (mostly driven by steep but temporary falls in income at the very top of the distribution) that accompanied the aftermath of both the early 2000s recession and the Great Recession, some even going so far as to suggest that the recessions had somehow solved the problem of rising income inequality. Yet the evidence is clear that this isn’t the case—recessions seem to only suspend the growth of inequality temporarily. This, of course, should not be a shock—declines at the top of the income distribution are driven largely by stock market movements, and the steep stock market declines of the early 2000s and 2008 bottomed out quickly, and stock prices rose relatively quickly thereafter. Figure 1 below shows the long-run rise in family income inequality. It tracks growth in average family income by various income groupings since 1947. A key feature of this figure is the extraordinarily tight distribution of income growth from 1947 to 1979 (all lines move upward in a tight bunch), and the rapid pulling apart of income growth thereafter (the lines start pulling apart from each other). Wage trends greatly determine how fast incomes at the middle and bottom grow, as well as the overall path of income inequality, as we argued in Raising America’s Pay. This is for the simple reason that most households, including those with low incomes, rely on labor earnings for the vast majority of their income. That is why my initial look at the data from the newly released Census Bureau report on income and, poverty in 2013 will look at wages and the incomes of working age households. The Census data show that from 2012 to 2013, median household income for non-elderly households (those with a head of household younger than 65 years old) increased 0.4 percent from $58,186 to $58,448. However, that modest growth barely begins to offset the losses incurred during the Great Recession or the losses that prevailed in the prior business cycle from 2000 to 2007. Between 2007 and 2013, median household income for non-elderly households dropped from $63,527 to $58,448, a decline of $5,079, or 8.0 percent. Furthermore, the disappointing trends of the Great Recession and its aftermath come on the heels of the weak labor market from 2000-2007, where the median income of non-elderly households fell significantly, from $65,785 to $63,527, the first time in the post-war period that incomes failed to grow over a business cycle. 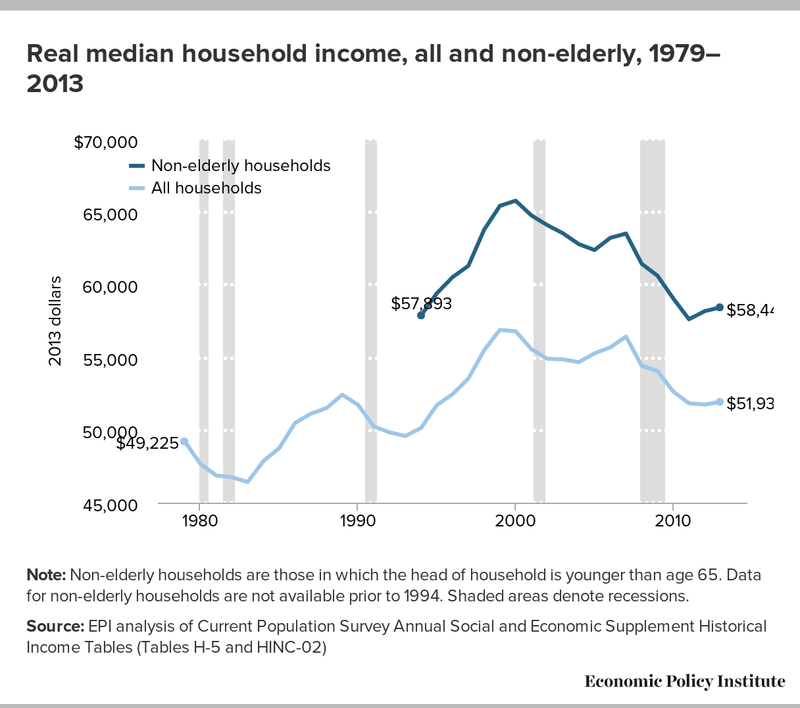 Altogether, from 2000 to 2013, median income for non-elderly households fell from $65,785 to $58,448, a decline of $7,337, or 11.2 percent. Note: Non-elderly households are those in which the head of household is younger than age 65. Data for non-elderly households are not available prior to 1994. Shaded areas denote recessions. What to Look for in next Week’s Census Income Data: How Long Will It Take to Claw Back Lost Years of Income Growth? Next week will see the release of Census data on family income (as well as poverty and health insurance coverage) for 2013. Before the data are released, it’s worth reminding ourselves of one thing that last year’s data showed clearly: economic recoveries in recent recessions have been increasingly unequal, largely mirroring the generation-long upwards march of income inequality more generally. And this pattern seems poised to continue in the recovery from the Great Recession. The figure below shows these unequal recoveries from recessions in a potentially new way. It essentially looks at just how many years of income growth were lost by each income grouping in various recessions. It measures this by simply counting how many years it took after a recession for each group to regain its previous income peak. For example, incomes for the middle fifth saw a peak in 1989 at $62,212. 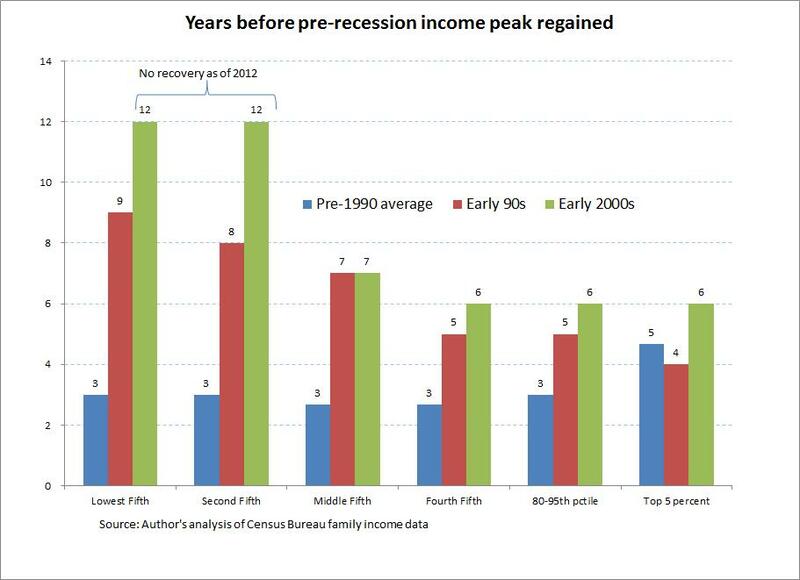 The recession in the following year led average income for these middle-fifth families to fall for a time, and the 1989 peak of $62,212 was not re-gained for these families until 1996, meaning that essentially seven years (from 1989 to 1996) of income growth for this group was stalled by the recession of the early 1990s. The figure below shows this number of lost years of income growth by income grouping across a range of recessions. The National Association of Manufacturers (NAM) is a cynical organization. It knows that few journalists will read a lengthy paper on the cost of regulation and realize that it is dressed-up junk economics, so it has published a re-run of the truly meretricious report that Mark Crain and Nicole Crain issued four years ago. The new report is even worse than its predecessor, in the sense that the authors have chosen not to respond to any of the criticism of their earlier work—even though it has been shown to be based on bad research, unreviewable and probably biased data, and faulty assumptions about the relationship between regulation and GDP. EPI’s Josh Bivens and others will deal with the main methodological problems with the Crains’ analysis. I want to focus just on the Crains’ re-use of the same indefensible research concerning the cost of OSHA regulation, which we first exposed in 2011. The Crains claim that OSHA regulations cost businesses $71 billion a year, even though the cost for new regulations since 2001 is only $733 million. How is it that the previous years’ regulation cost nearly 100 times as much? The Crains don’t have an explanation—they simply rely on someone else’s discredited work. Joseph M. Johnson published “A Review and Synthesis of the Cost of Workplace Regulations” in 2005. Johnson’s paper makes many serious mistakes, but the biggest is the application of a cost “multiplier” derived from yet another analyst’s work. Harvey S. James, Jr. estimated that the true cost of OSHA rules is not the cost estimated by the agency at the time of rulemaking (which often turns out, in reality, to be too high), but a cost 5.5 times greater because of “fines for violations and the costs of the many non-major regulations for which no cost estimates exist.” This multiplier is ludicrous on its face, both because OSHA fines have never amounted to very much (even today the maximum fine that can be assessed for a willful or repeat violation is only $70,000, and the amount paid is usually far less than what is initially assessed) and because the costs of non-compliance should not be double-counted as compliance costs. The Tennessean reported yesterday on the miserable work life of a 17-year old migrant worker named Ivan Alvarez, who lost three fingers when a tobacco farmer’s makeshift shearing machine sliced them off. How did the farmer treat him? He gave him a check for $100 and fired him. No worker’s compensation, no disability insurance, and no compassion. Young Alvarez was one of six migrant teenagers working at Marty Coley Farms in Macon County, Tennessee. He lived with 13 adult men in a vermin-infested three-bedroom house, and was paid less than minimum wage for six days a week of work. Why did Alvarez and the others put up with such mistreatment? As undocumented immigrants, they were trapped. A recorded conversation between the farm’s owner and one of the employees after the amputation shows how employers use the threat of deportation to oppress their workers and drive labor standards to the bottom. When the worker said he was leaving to take a better-paying job at another farm, the farmer, Marty Coley (one of the largest tobacco growers in the county), threatened him with deportation. It adds insult to injury to learn that, as The Tennessean reported, Marty Coley Farms has received more than half a million dollars in federal tobacco price support subsidies over the past ten years. One often hears that employers hire undocumented migrants because no American wants to do the kind of work they’re hired to do. Clearly, no American wants to live in overcrowded and disgusting quarters, be paid a subminimum wage, and have his fingers cut off. The answer isn’t to let this kind of exploitation continue—it’s to improve pay and working conditions enough that Americans will do the work, and to give immigrants the right to reject a job that degrades rather than rewards their labor. As long as the undocumented workforce is subjected to the threat of deportation, Marty Coley Farms and other low-road employers will continue to abuse and exploit them, to the detriment of every American. Last week, fast food workers across the nation went on strike to demand higher wages, more regular schedules, and the right to collectively bargain. These fast food workers are a part of the restaurant industry, which Heidi Shierholz recently investigated and found to be characterized by low wages, few benefits, and high rates of poverty. But how does the experience of workers in the restaurant industry compare to its CEOs? In 2013, CEOs of top restaurant chains in the United States made an average of $10.9 million, which is 721 times more than the minimum wage workers they employ. Restaurant are a part of the wider Leisure and Hospitality sector, which is also characterized by high rates of CEO pay and low rates of worker pay. In fact, CEOs at Leisure and Hospitality companies made, on average, 370 times the pay of a “typical” worker in that sector in 2013—making Leisure and Hospitality the worst sector in terms of disparity between CEO and worker pay. This ratio is far above the average CEO-to-worker pay ratio at all top companies, which in 2013 was 295.9-to-1. It’s also much higher than the next most disparate industry, Information, which has a CEO-to-worker pay ratio of 180-to-1, and the one after that, Trade, Transportation, and Utilities, which has a ratio of 178-to-1. For 12 months, McClatchy reporters have been carefully digging into a pit of corruption, gathering payroll records in 28 states and interviewing hundreds of workers and business owners about an epidemic of tax cheating, wage theft, and exploitation in the construction industry. The extraordinary report of their investigation was published Thursday, and it’s hair-raising. More than one-third of the employees working on federally-funded projects in Texas and Florida, overseen by public housing authorities and monitored by the U.S. Department of Labor, were improperly classified as independent contractors. The contractors misclassified them in order to escape paying worker’s compensation premiums, unemployment insurance taxes, and FICA taxes, to avoid complying with immigration document requirements, and to avoid liability for labor law violations. In just Florida, Texas, and North Carolina, McClatchy estimates that half a million workers were misclassified, and that the state and federal governments were cheated out of approximately $2 billion in taxes as result. The stories make the damage this does to the labor market utterly clear. Construction wages were lower in 2012 than they were in 1980, despite rising productivity and huge profits in the industry. Even skilled tradesmen like plumbers and electricians earned 12 to 14 percent less than thirty years ago. Labor law offers no protection to independent contractors, who are not entitled to the minimum wage, overtime pay, or the right to join a union and bargain collectively. Exploited workers—many of them undocumented immigrants who live in fear of deportation—work without adequate safety protections, sometimes receive far less than the pay they were promised, and are deprived of the safety net’s protections if they lose their jobs, are injured or disabled, or reach retirement age. They often live in slum conditions, even while working on luxurious and glitzy new housing. The jobs numbers today, along with a closer look at unemployment rates by demographic groups, point to considerable slack in the labor market across the board. A couple weeks back, I examined real (inflation adjusted) wages across the wage distribution. One of my findings was that real wages fell for all education groups between the first half of 2013 and the first half of 2014. As you can see in the figure below, real hourly wages fell even for those with a college or advanced degree. And, when we look at these declining real wages hand in hand with the unemployment rates of those with a college or advanced degree, it is obvious that the existence of any sort of skill mismatch is a myth. Today’s jobs report showed the economy added 142,000 jobs in August, far below expectations of job growth closer to 230,000. Prior to August, monthly job growth averaged 226,000 this year. The figure below charts monthly job growth since the start of the recovery in July 2009. While the general trend has gone up, this month’s job growth was disappointingly below trend. We haven’t seen job growth this slow since December of last year. While it’s yet to be seen whether this slower job growth is an anomaly or a new trend, these numbers should give us pause. Adding in this month’s disappointing numbers, job growth this year is still above last year’s average at this time. Job growth has averaged 215,000 jobs a month thus far in 2014, compared to 197,000 in the first eight months of 2013. We need to be consistently adding jobs at a much faster rate to return to the labor market conditions before the recession began. Arguably, that standard is a low bar as the labor market at that time still had considerable slack. What is more than obvious is that employers just don’t have to offer big wage increases to get and keep the workers they need, when hiring rates and net job creation remain far slower than what’s needed to generate healthy labor market outcomes. The result is that over the last year slow nominal wage growth, and inflation-adjusted wage stagnation (or even outright declines), have continued. Fast-food workers across the country are on strike today, as a way of demanding higher wages and calling attention to the extremely low wages of low-wage workers. As Elise Gould shows in her recent paper, Why America’s Workers Need Faster Wage Growth—And What We Can Do About It, the wages of low-wage workers (the 10th percentile of wage earners) declined by five percent over the 1979-2013 period, despite a generation of productivity gains (64.9 percent). Low-wage workers in the United States also fare very poorly by international standards, as the OECD’s recent Employment Outlook report reminds us. In the United States, according to the OECD, 25.3 percent of workers had “low-pay”—earning less than two-thirds of the median wage—which was the highest incidence of low-pay work among the twenty-six countries surveyed and far higher than the OECD average of 16.3 percent. 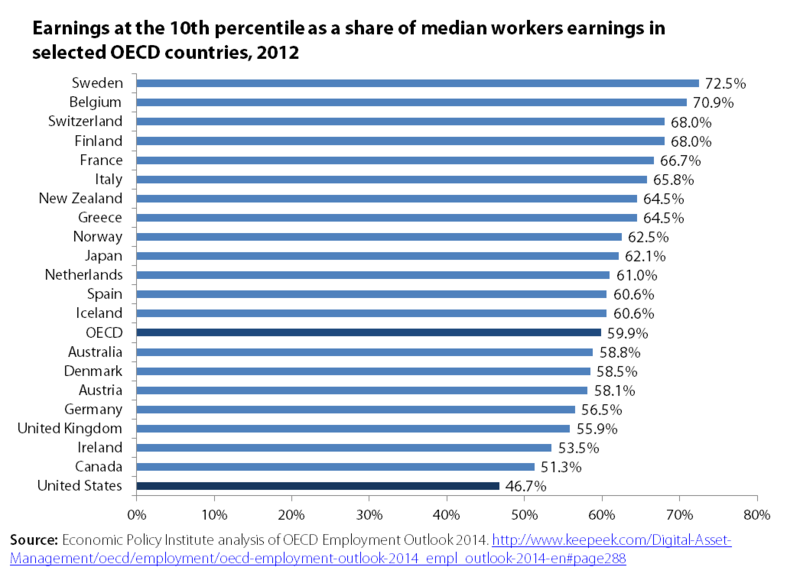 In fact, as the figure below shows, low-wage workers fare worse in the United States than any other OECD nation. Low-wage workers earned just 46.7 percent of that of the median worker—far beneath the OECD average of 59.9 percent in 2012. To catch up to the OECD average, U.S. low wage workers would need a 28 percent wage boost. The last several decades have been hard on working men and women in the United States. The decline of unions (which now represent just a little more than one sixteenth of private sector workers), job loss to Mexico, China, and other low wage countries, and a series of bad court decisions weakening the rights to effectively bargain a contract have left working Americans nearly defenseless, as wages stagnate or fall and traditional pension coverage disappears. The results are ugly: since 2000, 70 percent of Americans have seen no gain in wages, and wages have fallen for the bottom 40 percent. 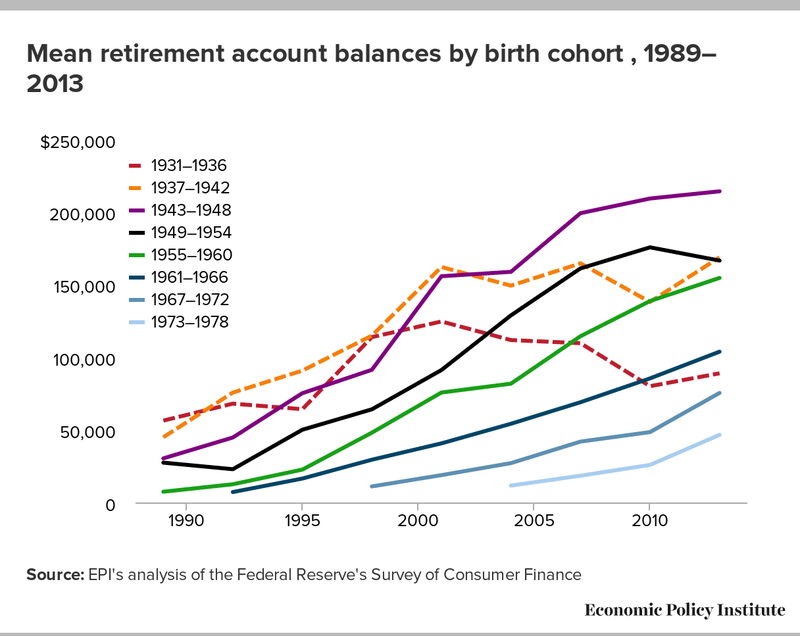 Traditional pensions are disappearing, to the point that less than 18 percent of workers still have this crucial benefit. Despite that grim background, there is cause for hope, and three events this past week brought a big smile to my face and lifted my spirits. The biggest lift came from two court decisions in California and Oregon (I’m a lawyer, I can’t help it! ), where a U.S. Court of Appeals struck down one of corporate America’s longest-running and most outrageous schemes to cheat workers and scam the government. FedEx, a giant in package delivery industry, has avoided payroll taxes, prevented union organizing, and escaped the laws that give workers meal breaks, overtime pay, sick leave, and family leave by entering into sham contracts with its 27,000 drivers in which it declares them to be independent contractors. Employees have employment rights, but independent contractors don’t. I am not as optimistic about my future as my peers tell pollsters they are. Relative to the two previous generations, Millennials have higher levels of student debt, poverty, and unemployment, and lower levels of personal income and wealth. All of this has been covered in depth by the media, but what doesn’t get nearly enough attention given its importance is how poorly the American labor market is performing for my generation. At EPI, we talk a lot about how weak labor markets hurts workers and their families (something that even The Onion has picked up on). Heidi Shierholz has documented the impact that labor market policies have on workers in various sectors, like domestic workers, and Josh Bivens and I wrote a paper showing how the weak labor market is the main challenge for middle class families in the aftermath of the Great Recession. But it can be hard to understand how the labor market relates to readers my age. With this post, I’m going to try to make the case for why young people should care about what’s going on in the labor market, and why it makes sense for them work to make it better. A weak labor market hurts the living standards of young people in two immediate ways. First, it disproportionately affects young people’s job opportunities. This is true in good and bad times: unemployment for younger workers is almost always about twice the overall unemployment rate. As of July 2014, the unemployment rate for young workers was 13.6 percent, while unemployment for workers ages 25-54 was 5.2 percent (relative to 10.5 percent and 3.7 percent in 2007, the last time we experienced a “strong” labor market). One of the reasons for this is obvious: young people are inexperienced relative to their older counterparts. In a time of labor market weakness, older, more experienced workers who are newly unemployed will apply to jobs they may be overqualified for, leaving young people to compete with not just their peers but also a larger pool of more experienced candidates. So even while the Great Recession officially ended in 2009, young people are currently facing one extremely competitive labor market. In writing my paper on the most recent wage trends released today, I came across an interesting finding: Wages at the bottom of the wage distribution were the only ones that didn’t fall between the first half of 2013 and first half of 2014. The figure below shows the change in real (inflation-adjusted) wages over this time at different points in the wage distribution. What is obvious from the figure is that wages have fallen for nearly every group. If I showed you the same trends by education, as I do in the paper (see Figure O), you’d see an even starker story: Wages over the past year have fallen for all education groups, including those with college or advanced degrees. So, why didn’t the 10th percentile wage fall like all others? What is so special about that wage that sits below 90 percent and above 10 percent of workers (i.e., is not generally earned by particularly privileged workers)? Simple—several states raised their minimum wage over that period. Today, we released a report analyzing the most recent reliable data on wages by decile and by educational attainment. These data are illuminating because they look beneath the overall averages presented in the regular statistical series covered by the media. On the one hand, these recent data look quite a bit like the couple of years of data that come before it—but that is still very revealing of what’s going in the economy. Overall, the trends over the last year—from the first half of 2013 to the first half of 2014—show that real, inflation-adjusted wages fell up and down the entire wage scale, with one revealing notable exception. The recovery has not been completely jobless for a while now, but it does continue to be pretty much wage-less, or at least wage-growth-less. Let’s start at the top of the wage distribution: those workers with the most education and the highest wages. Over the last year, real wages at the top of the wage distribution fell, by 2.0 percent at the 90th percentile and 0.7 percent at the 95th percentile. Real wages also fell for workers with a 4-year college degree, and even for those workers with an advanced degree. This is important in particular because it sends a clear message to the Federal Reserve Board. If even these groups of highly educated workers facing the lowest unemployment are seeing outright wage declines, there is clearly lots of slack left in the American labor market, and policymakers—particularly the Federal Reserve—should not try to slow the recovery down in an effort to keep wage and price inflation in check: they’re both already firmly in check even for the most privileged workers. While many strides have been made in the women’s equality movement, job growth among women and men in the aftermath of the Great Recession is not one. The solid lines in the figure below show job loss during and after the Great Recession by gender. Men lost far more jobs than women did in the Great Recession—over 6.0 million jobs, or 8.5 percent of their total December 2007 employment, compared to women who lost 2.7 million jobs, or 3.5 percent. Since the economy started regaining jobs, however, the gender dynamic in job growth has reversed—between February 2010 and the June 2014, men gained 5.5 million while women gained 3.6 million jobs. Second and more importantly, this is a corporate inversion involving a large U.S. corporation and a much smaller foreign corporation that was once a U.S. corporation. Yes, you read that correctly: Tim Hortons was a U.S. corporation prior to its inversion to Canada in 2009. Though to be fair, Tim Hortons started as a Canadian company—it was founded in Hamilton, Ontario in 1964. Wendy’s restaurant chain purchased Tim Hortons in 1995 and then spun-off the company in 2006. Tim Hortons inverted to Canada in 2009 arguing that they had substantial business activity in Canada.